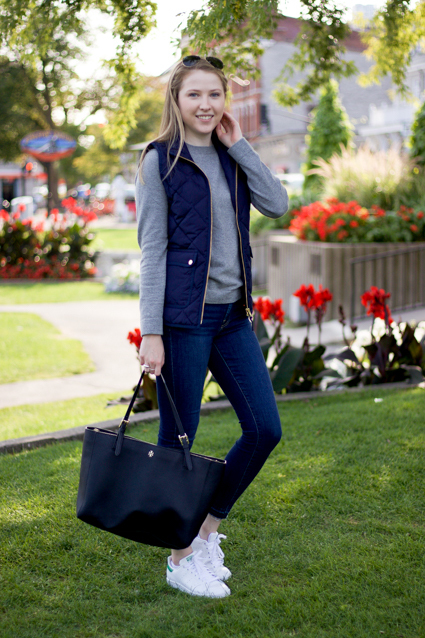 Here's a collection of fall items that I've been eyeing. The weather has been crazy hot here lately and I've been dying for the weather to cool down so I can wear fall clothes! 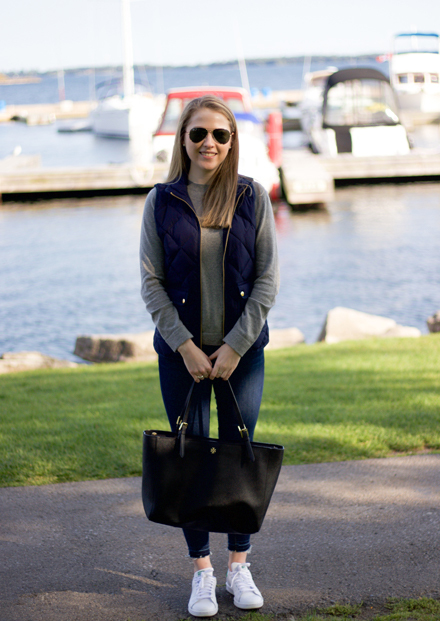 I'm so excited to be back with another outfit post! Last week was my first week of class and I loved checking out outfits on campus. Students at Queen's University get more dressed up for class compared to where I went for my undergrad, where you could get away with wearing sweats every single day (not that that's a bad thing!). In undergrad, I would often get comments like, "Why are you so dressed up?" and even, "Are you going to an interview?" because of what I was wearing, even very casual outfits. Personally, I love fashion and I don't see the point of saving my favorite clothes for special occasions! 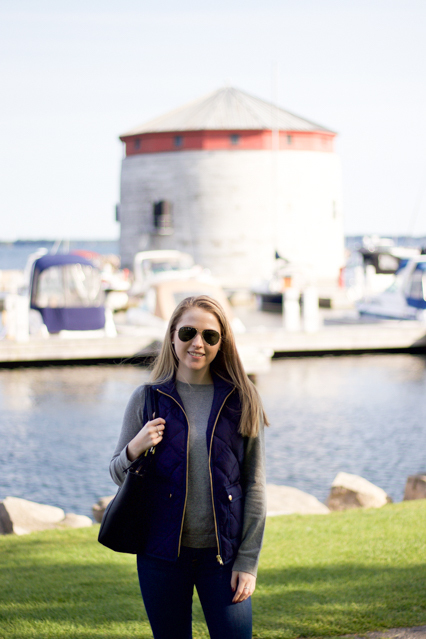 Popular trends that I've noticed include white sneakers, boyfriend jeans, and round sunglasses. While I won't be wearing loose, ripped jeans anytime soon, I love dressing down an outfit with my Stan Smiths. I was thissss close to returning them, but I've worn them almost every day since I've started college so I know they were a good purchase! I love this outfit because its so cozy and comfortable, but still looks put-together. What do you like to wear to class? Fall is by far my favorite season. I love the weather, the excitement of heading back to school, the smell of leaves in the air, Halloween, and the fashion. I feel like my sense of style thrives in fall. 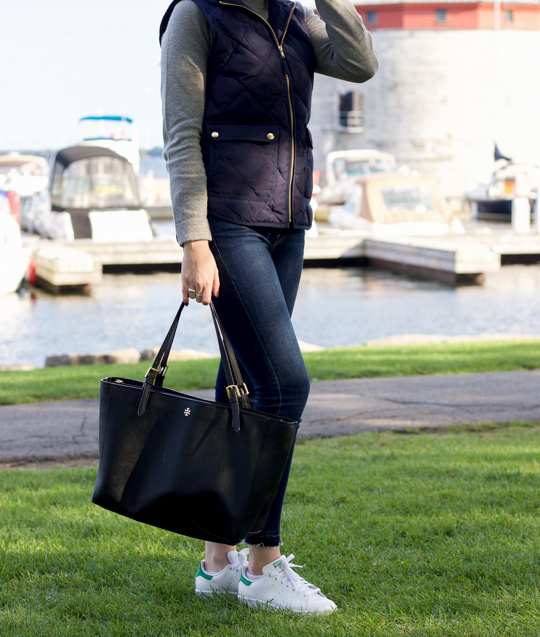 It's so easy to throw on a pair of jeans, riding boots or Hunters, a sweater, and a vest and look put together. In this guide I've included classic pieces that are great for mix-and-matching. As much as I love fun, trends like bell-sleeves and off-the-shoulder tops, these trends are not here to stay (I limited myself to one bell sleeve sweater this season). On the other hand, pieces like peacoats are timeless. Over the past few years I've slowly built a fall wardrobe that I'm quite content with, mainly with items in this guide. In fact, I couldn't think of anything that I really needed for autumn this year because these items are so versatile!